Let's eat all the spinach. The root is the best part. This is such an easy recipe that I wasn't sure whether or not to show you any photographs. However I have included some, anyway. It may be interesting to show you the way Hourensou no goma ae is made in my family. It has two features. Select the best sesame seeds, and eat the spinach whole. We use "Onizaki no Goma" sesame seeds in my family. It's one of our favorite ingredients. I'm planning to up about it someday. The way to boil spinach is to add 1 pinch of salt(with the thumb, the forefinger and the middle finger) in plenty of hot water, putting in one bunch of spinach at one time for a few minutes, and then cooling it in cold water. Some cook books suggest that it's better to prepare "cold water with ice cubes", but I think it's OK to use running water instead. If you don't mind preparing ice cubes, it's also OK. After the spinach is boiled, squeeze the pieces lightly. Then cut the spinach into pieces 3-4 cm in width. Add the spinach as well. The spinach root is hard, so it must be cut into fine strips and then sprinkled on the rest of the spinach. And.....it's beautiful, isn't? The red color looks very nice on that green color. Use Usukuchi-Syouyu (light soy-sauce) and Sake. 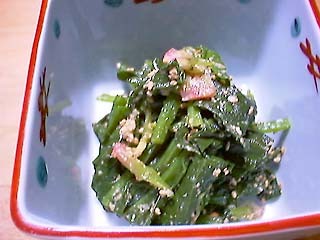 Some cooking books suggest adding Mirin(a kind of sweet Sake).But I don't think sweet Sake adds much taste to spinach. Just adding soy-sauce doesn't make the taste stronger, either. But if you add Sake, it may enrich its taste. Mix spinach lightly with these seasonings, then add sesame. The taste of sesame is incredibly delicious, and when I make "Spinach salad with sesame sauce", I always divided a bunch of spinach between the lunch boxes I make.